Steven (Chicagoland, United States) on 30 December 2009 in Architecture and Portfolio. To meet the demands of a growing parish that was located in a small school chapel since 1926, St. Anastasia Church was constructed in 1964. 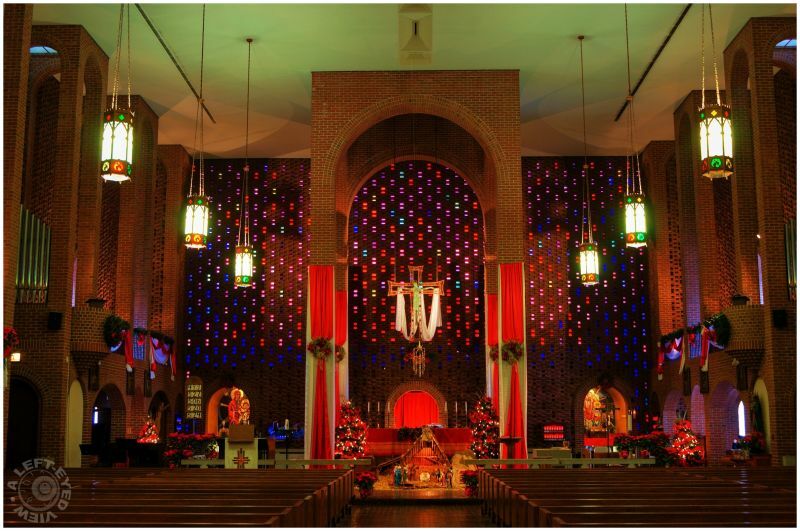 The church, located in Waukegan, Illinois, is a unique structure of towering brick columns and arches, with stained glass blocks set into the walls that transform daylight into rich purples, blues, reds and ambers to create an awe-inspiring interior. Unfortunately, Christmas morning had a relatively cloudy sky which didn't allow much light in through the east wall seen here. Pictured here in the center, between the four large columns and arches, is the altar which is made of a square marble slab. Hanging above the altar is a medieval style crucifix. Flanking behind the altar on the left and right are "enclaves" with ornate mosaics and tabernacle. Flanking above the altar to the left and right are "crows' nests" where liturgists are often found. Photo taken December 25, 2009. Crows nests :) Nice image, inspiring. Love the 60's architecture. Steven, I am using a MacBook and Firefox. The reds are saturated but not dark or over saturated. I recently viewed my blog on a PC and was shocked at how dark most of the images appeared. Hard light I can tell, but it is still a beautifully composed picture ! What a beautiful, beautiful Christmas photo. The colors are gorgeous and the entire scene is just lovely! Gorgeous. I especially love the lamps. Rich, beautiful colors inside this church building. Beautiful shot.. love the colours..
Really interesting style! From the brickwork I would have guessed its origin from the 1930s, with the glass wall from the 1960s. Super shot! i attended st anastasia school & church.as did eleven other siblings. i was baptized here.this is truly a beautiful building. thank you-again, to the person who put these photos up. have been very homesick this year, and just looking at the altar has been a blessing. i'm thankful the church is being cared for. i like visiting this site. thank you.